TeamDrive Forums • View topic - How can I share a file? Hello, I'm new TeamDrive user so i need some help in using this service. My first question: How can I read-only publish one version of the file? I uploaded some files and after some modification i already have a few versions of some of them. I would like to share one version of the file to a public forum, read only access. How can generate a link to a file version for public download? Re: How can I share a file? The ability to publish a file to the web is available depending on the license you have. 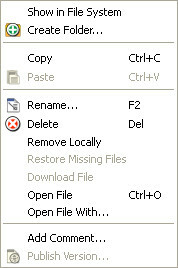 Right-click on the file you would like to publish and select “Publish Version” from the context menu (this action can also be carried out through the “Edit” menu on the menu bar). A new window will open displaying the generated URL. By selecting “Publish” the file will be uploaded to the server in an unencrypted form. This function cannot be used with WebDAV servers. The URL can also be dispatched via email. To ‘unpublish’ a file, first navigate to the desired file in TeamDrive. Looking in the version tree, find the version of the file that has been published, right-click on the file and select “unpublish”. Published files can be quickly found using the search filters. You can find more info on search filters in section 4.1. If it's an editable file than the file can, of course, be edited if someone downloads it from the link you provide and edits it. The edits, however, will not be synced back to the original file. If you do not want anyone to have the ability to change the file at all, you should lock the file with the program you are using so and make it read-only. Then you can publish this version of the file with the locked/read-only attributes. I tried the Right Click on the file but the option for publishing a file is Disabled. After searching through the web site i can only draw the conclusion that only users with Professional License can use this feature. Can you confirm that my assumption is correct? I assume that if I share a file by URL to make it publicly available, the users which have the URL will be able to download it without having TD installed. The user will get an un-encrypted file. Does this mean that for the files I share, the encryption for those files is removed on the TD server? Or does the the TD server create an unencrypted copy of them to share arround? No. You publish an non-encrypted link to the file. The file remains encrypted on the server. To can remove this link at your leisure.